Vacation season has arrived, and if you’ve got a trip planned, you need to take some key steps to prepare your garden for your absence. After all, you’ve probably invested more than your fair share of time (and money!) nursing your plants through a difficult spring, getting new vegetables established, and planting up those containers. So, don’t drop the ball when it comes to vacation preparation. Leaving the garden unattended can be stressful. I certainly get that. Between travel for speaking engagements or for filming Season 9 episodes of Growing a Greener World®, I’m away from my garden quite a bit during crucial weeks in the growing season. 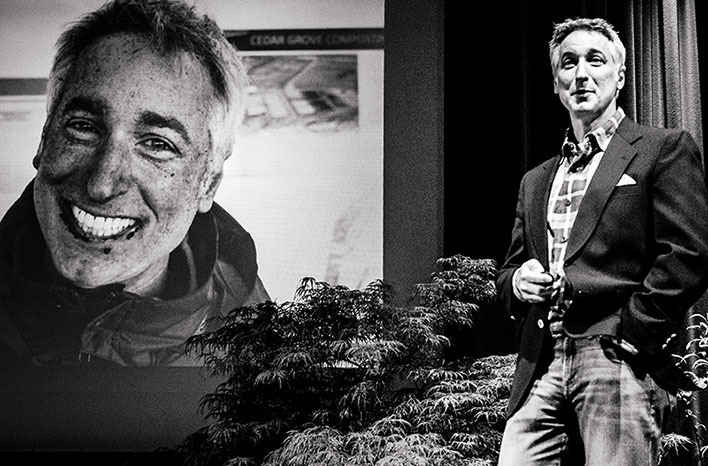 Between filming for Growing a Greener World and various speaking engagements, I’m on the road a lot. Is this considered a Study in Contrast? Fortunately, I’ve learned how to put my garden on autopilot, so I don’t need to worry about things. Actually, I get pretty excited to come back and see how much has changed – in a good way – while I’ve been gone. With a little planning and some proactive steps, you can rest easy too and come back to the pleasure of a landscape that has thrived while you were away. The most important factor you need to nail down before you hit the road is weather. Take a look at the projected forecast, so you can better plan how to account for conditions while you’re away. Just remember that more plants die from overwatering than underwatering. It’s best to let your plants get a little too dry versus struggling with soggy roots. Now, we all know the forecast isn’t always reliably accurate. For that reason, I strongly recommend keeping an eye on the weather while you are away. Check in to see how much rain your area has received during the past day or two, for example, so you can decide if you need to adjust your watering system or put in a call for help when possible. A rain gauge – or even an empty tuna can – can provide a low-tech and instant indication of how much rain you’ve received in a specific location. They are also an easy way to determine how much water is being delivered by an irrigation system. My go-to resource for those current and historical details is Weather Underground. There you can review high and low temperatures, rainfall, etc. to get a better feel for what’s happened weather-wise back home. My favorite way to track weather while I’m on the road is a weather monitoring system that I’ve placed directly at the GardenFarm. The system measures the temperature, precipitation, wind, etc. and transmits that data to an app I can check from anywhere on my smart phone. That probably sounds expensive and complicated, but it’s not. I got mine, an AcuRite Weather Station, for around $140. It’s available online, and it’s been well worth every penny. It wasn’t difficult to set up either. I rely on mine even on those days when I’m home. It’s GardenFarm data is always on display on my computer monitor. Not that I’m weather-obsessed or anything. This fixation is normal, right? If you are lucky enough to have a friend, relative or a neighbor who has some gardening chops and is willing to cover for you while you are away, there’s nothing better. Maybe you have a garden-loving group of friends who trade plant-babysitting duty during vacation season. If you don’t have that support system in place, it might be worth talking with like-minded folks in your social circle to set one up. It’s certainly best if the person willing to be your “boots on the ground” is someone who does have basic gardening skills. When you need to rely on a non-gardener, try to make the task as simple as possible. Group like plants when possible; and put hoses, sprayers and other items where they can be easily accessed. Leave a few good instruction notes – brief, simple and to the point. Smooth the way as much as possible to set your temporary caretaker up for success. By grouping container plants, you can target them with one sprinkler while you are on vacation. A shady spot is the best option to slow down evaporation. For those of you who don’t have a reliable helper, check with your local county extension office or Master Gardeners group. They may know of someone who is interested in volunteering to lend a hand. If you’re willing to pay someone to help, that might generate some additional interest too. Another option could be to check online. Resources like Craigslist, NextDoor, Facebook groups, etc. all provide opportunities to connect with someone interested in “yard sitting.” If you go this route, just be sure not to post that you are going on vacation. You definitely don’t want to advertise that you are about to leave home for a couple of weeks. Instead, use these online sites to find people who are posting their interest in caretaking. Reach out to those individuals directly – preferably after you’ve had a chance to check some references. Don’t share your schedule until you have reason to be confident it’s safe to do so. Sometimes, you can’t make arrangements for anyone to take care of critical tasks like watering. Fortunately, we have access to some great technology these days to keep our watering on autopilot. Systems can be simple or complex, inexpensive or an investment, and everything in between. 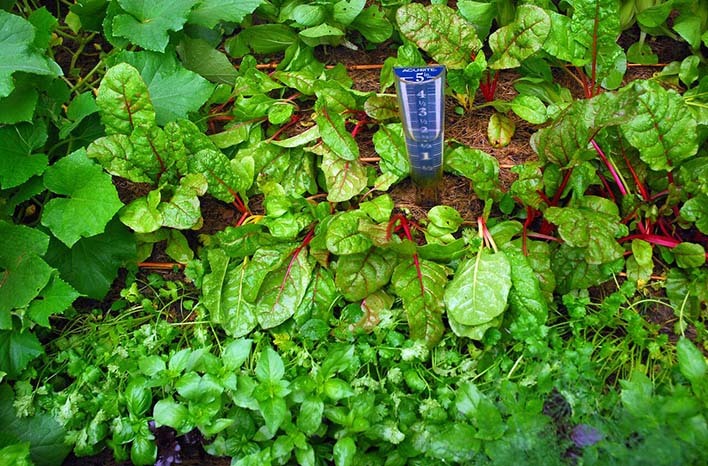 Hopefully, you have already set up drip irrigation throughout your garden beds and containers. Drip keeps moisture nearest to plant roots and at a slow rate those roots can easily take up. 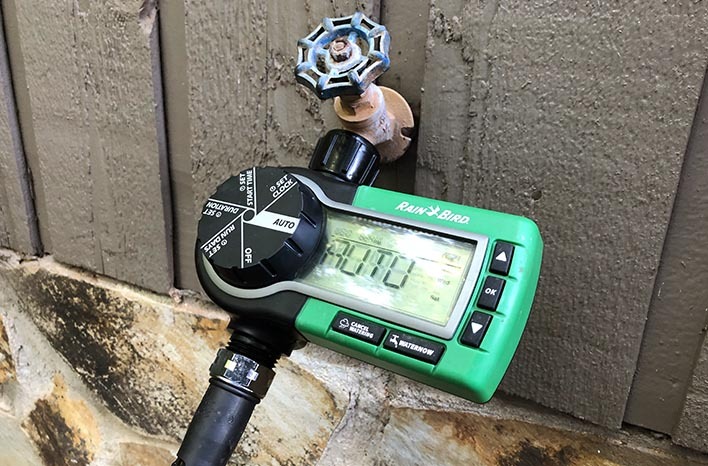 Once that system is in place, all you need to automate your watering is an inexpensive, battery-operated timer. Pre-set the timer to run on a specific schedule, so irrigation continues like clockwork while you’re enjoying time away. You might want to splurge on a wifi-enabled timer. You can adjust it remotely, so you can turn it off or on as needed – all without ever leaving the comfort of your cabana chair. I love a good gadget, and this handy unit will set you back around $65. 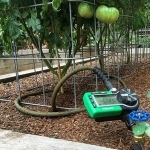 A timer can work with just a garden hose and sprinkler too. Congregate as many plants as possible into one location – ideally a shady spot. 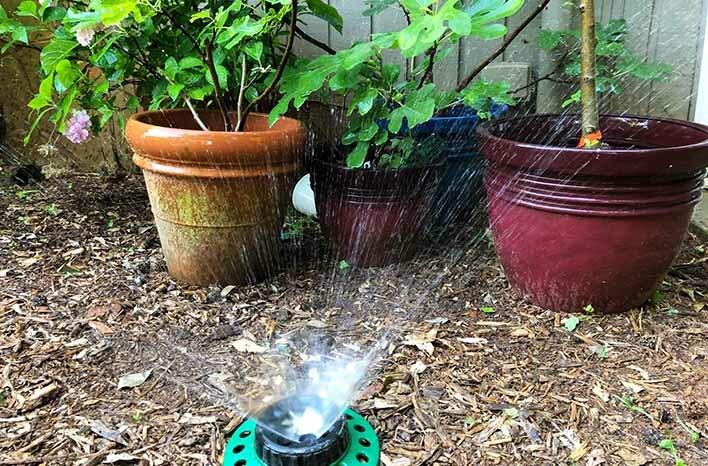 Target your sprinkler – with timer attached – at the group, and your plants will be watered on schedule. Battery-operated timers are an inexpensive, effective way to automate watering in your garden. If you need to water a large area, I recommend setting up that sprinkler on a tripod. The elevated spray will cast farther for broader coverage. Be sure to anchor each leg of the tripod with sandbags or anything else which will prevent the sprinkler from wobbling out of balance or being knocked over. Trust me – you don’t want to come home to damage caused by an overturned sprinkler. Overhead irrigation with a sprinkler is never ideal, but it is better than nothing. Just remember that timing is everything when you use this option. 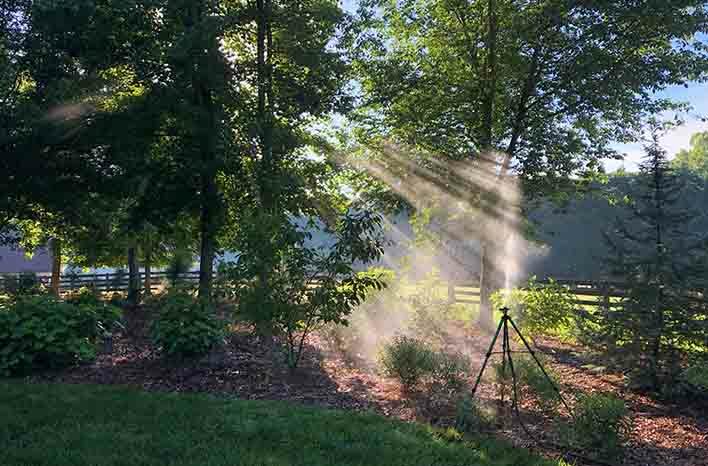 Only run sprinklers in the early morning hours – during the dew cycle – to reduce evaporation and allow foliage as much time as possible to dry out before evening sets in. Wet foliage is at higher risk of disease. So, how to know how frequently or long to water for? Ideally, your system will provide about an inch of water during the course of the week. Remember too little is better than too much. Test your water delivery by placing an empty tuna with the plants being watered. As water collects in the can, you’ll be able to identify how long it took to hit the one inch mark. A true test can only be done over the course of a week, so plan accordingly. Use water bladders, like Treegator®. These work great around trees and shrubs. Just fill the bladder, place it around the base of the plant, and water will slowly seep out over several days through small holes. You’ll find these come in handy for years to come. 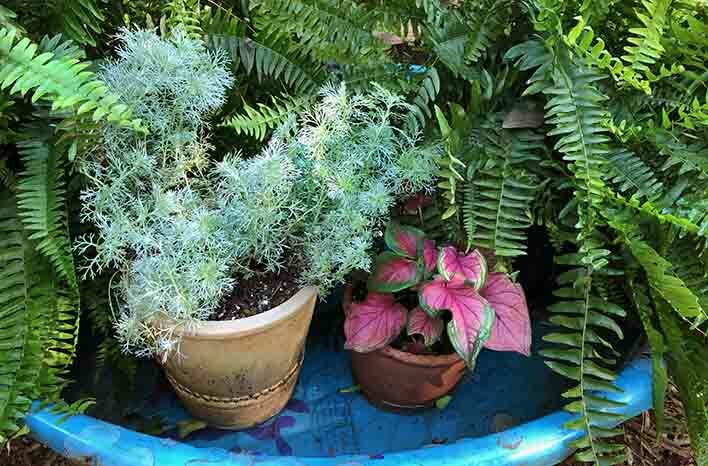 Gather container plants in a plastic kiddie pool and in a shady spot. Fill the pool with an inch or so of water (accounting for the weather and duration of your absence). Plants will wick water up through the holes in the bottom of those containers. Poke a hole or two in the cap of an empty milk jug, soda bottle, etc. Fill the jug with water and place it upside down in the soil of your bed or container. Water will slowly seep out the holes in the cap. Be sure to submerge the cap securely into the surface, so it won’t tip over. Also, make sure there are no other holes in the container, which would cause all the water to drain out too quickly. Set container plants in a plastic kiddie pool. Fill the pool with an inch or two of water. The water will slowly wick up to plant roots through the holes in the bottom of the containers. These ferns would be a goner within a week without a system like this to keep them watered. If you have houseplants and will be gone more than a week. The milk jug/soda bottle option would work just as well indoors. You could also relocate plants into your shower stall or bathtub and fill the tub with an inch or two of water. Close the door or curtain to keep humidity levels higher, and your plants should be as perky when you get home as they were when you left. Sometimes, we don’t have time to plan or prepare. Life happens, and we can get called away without the opportunity to take proactive measures in the garden. With whatever time and resources you might have available, focus on new trees and shrubs. When trees or shrubs are still establishing, they should be your emergency-care priority. These plants are investments and will be hardest to replace if left neglected. Likewise, any specimen plants should be your next priority. Garden vegetables, annuals, and smaller perennials are easier and less expensive to replace. Watering isn’t the only concern if you’ll be away from your garden for more than a few days. Pests and disease never take a vacation, but here too, proactive measures can be a game-changer. First and foremost, spend time looking over your plants – really examine them. Your vegetable plants will be most at risk, so focus your time there. Check the foliage for signs of chewing, discoloration, eggs, yellowing, or any other warning signs. Most importantly, check the underside of those leaves. That’s where most of your pest warning signs will show up first. If you find something to be concerned about, manually remove the pest or diseased growth whenever possible, and then, consider treatment. (Never add diseased growth to your compost pile.) Do everything you can to try to eradicate the problem before you leave. Proactive treatment is worth considering too. Sometimes for example, I apply copper fungicide around my tomatoes before I travel. If I think powdery mildew might be on the horizon, I’ll pre-treat with a 2 parts water and 1 part milk solution. Your vegetable plants are at greatest risk for pests and diseases, so check them carefully before you leave for discoloration, chewing, eggs, etc. 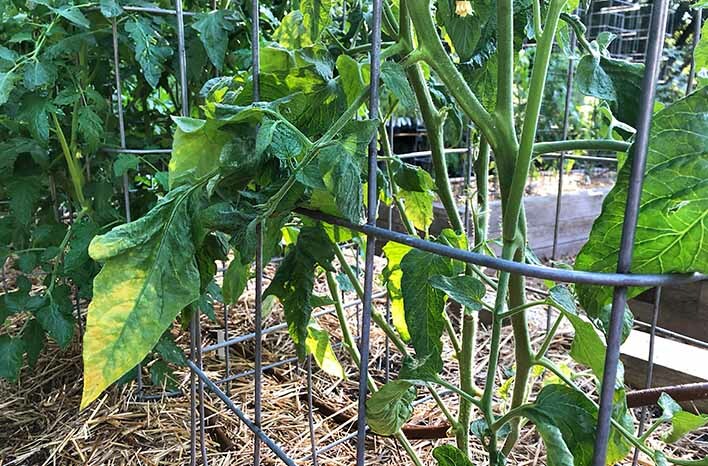 Covering young plants with floating row cover will create a barrier against invading pests but still allows light, air, and moisture to reach the plants. However, I recommend against floating row cover for mature and fruiting plants. You don’t want to block pollinators from doing their work. If you typically spray something like a deer repellent, apply that treatment right before you leave to avoid potency wearing off before you return from your trip. No matter how you plan for your time away from the garden. Be sure to give all your plants a good drink right before you leave. Whichever watering option you choose or if you don’t have time to set up watering at all, make it a priority to add mulch to your garden beds. At a minimum, add a layer right at the base of your plants and trees and spread out to their drip line. Mulch can be the make-or-break difference in plant survival during periods when supplemental watering isn’t possible. With an inch or two of mulch in place, soil will remain moist for days longer than if it was exposed to sun and wind. Mulch provides a multitude of benefits all year long, but you will really appreciate it’s insulating effects during vacation time. One more thing – don’t forget the birds. Fill those bird feeders to the brim to prevent the supply running out too soon. These key vacation preparation steps take time and some planning, but you’ll have more peace of mind during your downtime knowing that you set your garden up to continue to thrive while you are away. Have I missed your favorite planning step? Share yours in comments below. We would all love to add them to our preparation arsenal. I expand on some of these key steps a bit more in the podcast recording, so I invite you to scroll to the title on this page and check that out. Look for the green bar and press the play icon. You might even consider going to iTunes or Stitcher or any of the other popular podcasting apps to download and binge-listen to the other 54 episodes. Some folks have found them to be the perfect way to pass the time on long road trips. Just sayin’.